The name and label of this new expression calls to mind the flag of Brazil, hosts of the 2014 World Cup, and its passion for o jogo bonito, “the beautiful game.” Well, we share a passion for Ardbeg, and were eager to try o dramo bonito [or “o uísque bonito,” which I think includes the Portuguese word for whisky]. Smoke pulled through long bamboo pipes by trained hippos at a Dr. Seuss-themed Safari park in Namibia. Burning clouds, ignited in an apocalypse. Herbal: Bright, broad-leaf thyme fighting it out with rosemary in an oiled-swimsuit match. Green peppers sizzling on an ironwood fire. All of this and more on the nose. Peat hides like a skinny kid under his covers in the winter; you can’t even feel him until you pull it back the duvet. Perfume, gold, caramel–these make far better gifts from the Magi than frankincense and myrrh. Very pronounced bouquet of bourbon vanilla. Creamy but not thick. Whole pod vanilla split lengthwise on a crème brulée that your daughter wants to send back “because of the tiny ants, Daddy, the tiny ants!” You show her that there’s nothing to fear and that they aren’t ants by taking bites and smiling contentedly. Denatured cinnamon. It’s like cinnamon limping out into the hallway for a cup of coffee at the two-hour mark of an ad hoc planning committee meeting. The finish is a time to reflect on how brilliantly integrated the peat is. Malted barley gilded with rose-gold leaf and then set in an engagement ring setting around a multi-faceted jewel of peat. This is not one of those peat forward drams that tries too hard, like hybridized chilis in a hot sauce that hits more than seven digits on the Scoville scale. So balanced! With my glass almost empty, I raise it in toast. But before Bill’s glass can touch mine, I’ve dropped it onto the table. Bill accuses me of flopping but already Stephen has assigned him a yellow card and refilled my glass. I win. 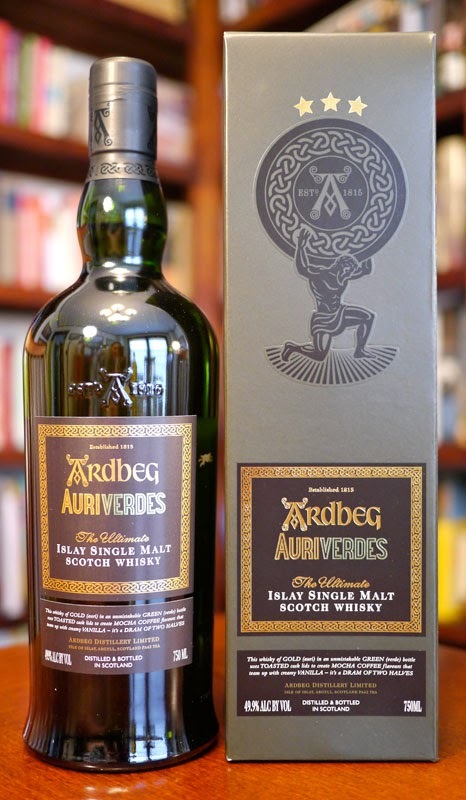 The Ardbeg Auriverdes is Zinedine Zidane’s infamous headbutt in the 2006 Final–Utterly memorable, even for those who don’t really follow the sport. If you want to make sure a guy can’t flop on you, just drop him. To hell with your team.